BOCA RATON, FL (March 12, 2013)— A crowd of 600+ was treated to a very personal “unforgettable” performance by nine-time GRAMMY® award-winner Natalie Cole at the second annual GENERATIONS Concert benefit recently held at the Keith C. and Elaine Johnson Wold Performing Arts Center at Lynn University in Boca Raton. The evening raised more than $170,000 for music education through Nat King Cole Generation Hope, Inc.
Twin daughters of music legend Nat King Cole, Timolin and Casey Cole of Boca Raton, launched Nat King Cole Generation Hope, Inc. (NKCGH) to honor the legacy, music and life of their father in 2008 after learning of budget cuts in public schools directly affecting the arts. Since that time, donations have benefited more than 5,000 children with “the greatest need and fewest resources” in Miami-Dade, Broward and Palm Beach counties. The Cole twins come from a family with a history of musical excellence and charitable giving, with their father a trailblazer in the music industry and mother Maria, also an entertainer, known for supporting multiple causes throughout her life. By giving students the opportunity to enhance their musical talents and abilities, their family’s legacy lives on. The benefit—NKCGH’s largest annual fundraiser— opened with students from the NKCGH “Summer Strings” music mentoring program at Lynn University along with appearances by talented local youth performers including guitarist Andrew Foreman, jazz vocalist Zoe Fromer and pianist Jermaine Teague. The classically trained South Florida twosome known as Black Violin followed with an opening act, fresh off their performance at the inauguration of President Barack Obama, including a showcase of their genre-defying blend of classical, hip-hop, rock, R&B and even bluegrass music. 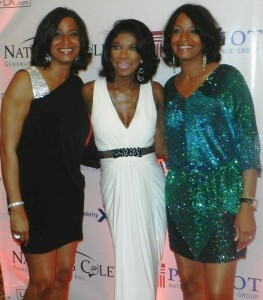 As though performing in her own personal living room, headliner Natalie Cole shared family moments and serenaded the audience with an elegant, intimate rendition of many of her father Nat King Cole’s classic hits, including “Route 66” and “L-O-V-E.” She also performed “Unforgettable” and “Walkin’ My Baby Back Home” as a virtual duet with Nat King Cole himself through the use of a recording. GENERATIONS Concert sponsors include Platinum Sponsor Patriot National Insurance Group; Silver Sponsor Celebrity Cruises; Bronze Sponsors Allied Health Institute, Excel Services Corporation and West Boca Medical Center; Patron Sponsors Florida Power & Light and Global Tower Partners; and Partners Boca Raton Bridge Hotel, Boca Raton Resort & Club, Cruisin-America, Dawn of Designs, Kaye Communications, Inc., Lynn University, and SmartCruiser.com; and Media sponsors The Boca Raton Observer, The Boca Raton Tribune, Seaview Radio and LivingFLA.com. The mission of Nat King Cole Generation Hope, Inc., a 501(c)(3) non-profit organization, is to provide music education to children with the greatest need and fewest resources. It is accomplished by funding programs that provide for instruction, mentoring and resources. Their vision is that Nat King Cole’s unforgettable legacy will ensure future generations are given the opportunity to learn and experience the joy of music. For more information on NKCGH, call 561-213-8209 or email info@natkingcolefoundation.org.